SmartAssembly is a process capture tool that allows users to focus on the design process, instead of being bogged down with the repetitive tasks that are present in every design. It is a development engine that allows users to create UDF’s, assemble existing parts or sub-assemblies, and configure new parts or sub-assemblies with associated drawings from existing company templates. Users develop programs in a simple easy to use language. Most programs are only a few paragraphs regardless of complexity. SmartAssembly provides a powerful script language to define complex Creo templates using components, UDF’s and any available Features. Dimensions, Parameters and References can be defined in a flexible table-structure that will also drive the dynamic assembly GUI. SmartAssembly also provides powerful machine design functions, such as bolts and dowel pin connections, library management and many other standard component functions. SmartAssembly is a powerful automation tool for any part or assembly typically placed as a library component as well as large complex assemblies with complex relationships between parts. Automatic relations from analysis features when assembling a component – users never have to edit or create the relations. Export parameters or references from UDF’s for use elsewhere in the program, such as placing a hole UDF and then passing the axis of the hole to a bolt to be assembled. Display measurement information and pass them for use in UDF’s or in components – no more taking multiple measurements, writing them down on a piece of paper, and then doing the work. Rich programming flexibility – loops, conditional statements, variables, etc. Call UDF’s for part level features. Support for Manufacturing Automation – create 3, 4 or 5-axis complex milling manufacturing UDF’s, even trajectory sequences! Ability to use assembly commands such as MATE, ALIGN, CSYS. Selecting references using commands such as POINT, PLANE, CSYS, AXIS, etc. FOR loop – used to assemble multiple components; such as to assemble several bolts to a pattern of datum points or several on surface datum points created as a single feature. The FOR loop command determines if the feature is an instance of a pattern and then asks the user to place the component at all other instances. Standardization of assemblies and parts – Just think of standardizing your assembly constraints and part level features without SmartAssembly. How much effort is lost trying to track down external references? 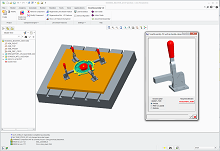 New users can be productive in a fraction of the time – show them the icon, select the required references, turn on or off different options, enter values for parameters and hit Ok. SmartAssembly assembles the component and creates the required part features. Advanced users create designs faster allowing them to focus on the design process. All components and features created still have full redefine or edit definition capability. UDF organization – eliminates common UDF problems such as UDF naming, gph file location, or required references. All UDF’s are at a simple mouse pick away. The GUI is defined with an image that shows the users exactly what references are required and allows them to input values for variable dimension UDF’s.